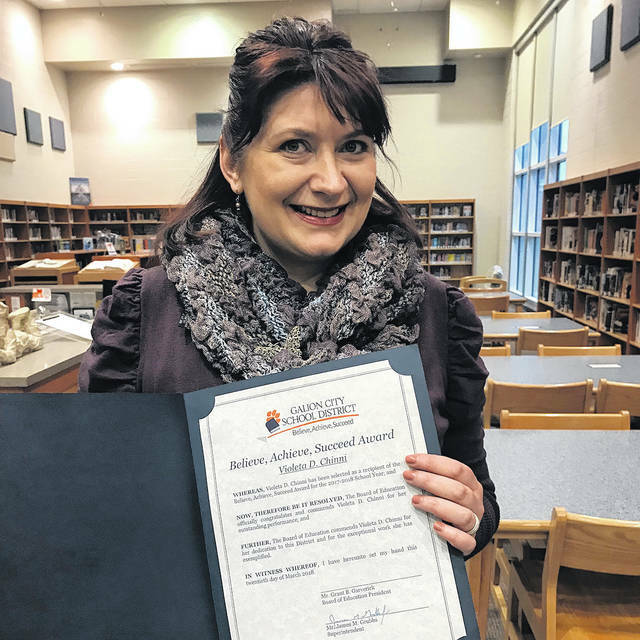 GALION — Galion High School French teacher Violeta D. Chinni is the latest recipient of the Believe, Achieve, Succeed Award. She was honored at Tuesday’s Galion school board meeting. Chinni, who has been with the district four years, was described as being positive, enthusiastic and engaged with students by one of her peers. Another said she was a powerful force with her students in her short time in Galion and is impressed at how Chinni inspires her students. Chinni organized an extensive field trip for her French students to New Orleans in 2015, Quebec City in 2016 and is in the final planning stages of a student trip to New York City in 2018. She is planning a future trip to Niagara Falls and Montreal. School board members also recognized Galion City School’s athletic department and AD Kyle Baughn for earning an Award of Excellence. The award is a collaboration between the Ohio High School Athletic Association (OHSAA) and the Ohio Interscholastic Athletic Administrators Association (OIAAA). The board recognized outstanding achievements of the winter sports teams and student-athletes, and then accepted donations totaling nearly $14,000 from the Galion Booster Club, Christ United Methodist Church Mission Fund, the Arthur J. Freese Charitable Trust and the Walter R. Hessenauer Trust for various areas of district operations. The next school board meeting starts at 6:30 p.m. April 17 in the library/computer lab atGalion Middle School. Courtesy photo Galion High School French teacher Violeta Chinni received a Believe, Achieve, Succeed Award during Tuesday’s Galion School Board meeting. https://www.galioninquirer.com/wp-content/uploads/sites/38/2018/03/web1_violeta-chinni.jpgCourtesy photo Galion High School French teacher Violeta Chinni received a Believe, Achieve, Succeed Award during Tuesday’s Galion School Board meeting.